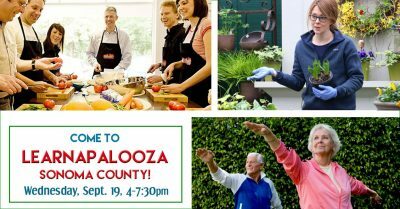 PROFESSIONAL DEVELOPMENT: Come to "Learnapalooza Sonoma County" on 9/19! What do you want to learn? Gardening, art, cooking, wellness? Local classes and workshops of all kinds are offered by organizations and individuals throughout Sonoma County. Come learn about lots of them at Learnapalooza! What can you do at Learnapalooza? Find out about learning opportunities of all kinds! See samples and demonstrations, and try some hands-on activities. Register for classes you want to take! If you or your organization offer classes or workshops, you’re invited to participate in Learnapalooza! Botanical Dimensions: Learn about all manner of things ethnobotanical. Daily Acts: See how you can use your home’s graywater to irrigate your landscape. En Garde Fencing: Kids (and adults too) can try out the art of fencing! Fiber Circle Studio: Make a fiber arts craft! Healdsburg SHED: Learn about upcoming events and workshops. Osher Lifelong Learning Institute (OLLI): Learn about classes for adults age 50 years old or better. North Coast SCORE: Find out how to start or grow your business. Sally’s Parlor: Tea-tasting with a Certified Tea Sommelier. Sebastopol Community Cultural Center: Find out about a wide variety of activities for students of all ages. SoCo Aerial Collective: Watch exciting demonstrations of the graceful art of aerial silks! Yarnitudes: Watch spinning wheel demonstrations and learn about fiber arts classes.